Remote Southwest reservations are often impoverished and the economic disparity between the Southwest Indian communities and the rest of American society continues. 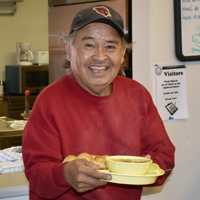 Thank you for your help in providing Elders like Frank with the nutritious meals, and hope, they need. Your online donation is the most cost-efficient method of giving, allowing us to use more funds to help those we serve. If you would rather make a donation by phone, please call (800) 811-6955. If by mail, please print this donation form and send it, along with your check made out to Southwest Reservation Aid™. * Quantities are limited. Please allow 6-8 weeks for delivery. Over 900 servings of food can be provided with your gift of $100! Over 650 servings of food can be provided with your gift of $75! Over 450 servings of food can be provided with your gift of $50! Over 300 servings of food can be provided with your donation of $35! Enter an amount you see fit to help Native Elders in need. Yes, I would like to help even more Native Elders by repeating this gift every month. Yes, please send my SWRA Calendar for my gift of $35 or more. Yes, I would like to receive updates and information from SWRA. Thank you for choosing to help Native Elders and families in the Southwest, Friend.